I have a confession to make, I love Mark Warner Holidays. I have to be upfront about this because as a reviewer you really need me to be unbiased and objective. But I don’t think that’s a problem. You see I love them because they are so very very good at what they do, so there is an odds-on chance you will love them too. What they understand, and this is the key to any successful family holiday, is that for the parents to have a good time the kids have to have a good time and Mark Warner work very hard to make sure this is the case. We’ve just returned from their Lakitira Resort in Greece. We flew over on a British Airways charter from Heathrow and the ten minute airport transfer at the other end and civilised departure time meant we turned up relaxed and in good spirits, as opposed to suffering that awful “charter frazzle” that can accompany middle of the night departures to middle of nowhere airports. This wasn’t our first MW holiday. We’ve visited Praia Da Luz, San Agostino and Levante resort in the past and, like the last two, Lakitira sits right on a beach surrounded by typical Greek countryside. Unlike the last two , however, once you get through the gates of this Kos-based complex you’ll find a complex that nestles amongst pretty gardens on a promontory with that beach wraps itself around the hotel giving it a breezy and spacious feel. The accommodation consists of hotel rooms (Lakitira Suites and the hotel itself) plus groups of standalone villa apartments (Lakitira Village), where we were based for the two weeks. Our large two bed apartment had just been refurbished and it showed. The large downstairs double room easily swallowed a double bed and sofa with an en-suite bathroom by the front door. Upstairs is similar: another double room, albeit slightly smaller and another en-suite bathroom. Those sleeping at the top of the stairs also get their own balcony and both rooms had flat screen TV’s and fridges, which brought squeals of delight from my children. We had sea views from both floors so every evening a fun family argument would kick off as to where to sit and watch the sun go down. The accommodation forms the hub of the resort and is surrounded by the various activities which are synonymous with the firm’s brand. There are ten floodlit tennis courts, eight at the front of the hotel next to an adult’s only pool and two at the back, almost on the beach. A family pool, flanked by the main eating areas, sits between the hotel and the waterfront. Watersports (including sailing, windsurfing, kayaking and scuba diving) are a short walk through the gardens past yet another bar close to the mountain biking centre. All of these (except scuba) are included in the price of your holiday. If it sounds a bit busy and frantic it’s not. The pretty gardens and trees give the whole place a calm, if purposeful feel. It’s also been very cleverly designed with gorgeous stress-busting views from the bars over the Aegean Sea, where I’d often sit with a coffee/ice cream/gin (delete depending on the time of day) and watch the world slide by. I’ve spent a lot of time reflecting on what makes these holidays work so well and I think a large part of it is down to the quality of the recruitment. The staff, whether sailing instructors, tennis coaches, yoga teachers or anyone else, are all enthusiastic, encouraging and absolutely lovely. It’s a hard balance to get right. One wants to feel all these activities are accessible, without being under pressure to take part, if you just want to sit on a sun lounger and relax, but get it right they do. The childcare “machine” will be of interest to most NappyValleyNetters and it doesn’t disappoint. They’re effectively operating a full time nursery for babies and toddlers which morphs into a play scheme for the older kids and a youth club for teenagers right the way up to seventeen. They also offer kids clubs in the evening for children who still want to play after supper and monitored sleeping in their nursery for babies and toddlers who need to go to bed before their parents. The care isn’t quite all-day, there is no cover over lunch, but it does mean that for exhausted parents you can reclaim some “couple” time for huge chunks of your vacation. “But why go on a family holiday only to put your children in childcare?” is a pretty common question from my friends when I explain the appeal of these breaks, but I’m afraid they’re missing the point. The childcare here isn’t some listless monitoring of offspring whilst parents glug Pinot by the pool. It’s full on fun using all the resort’s facilities and activities. Who is that playing “sleeping lions” in the mini-pool? It’s the toddlers. 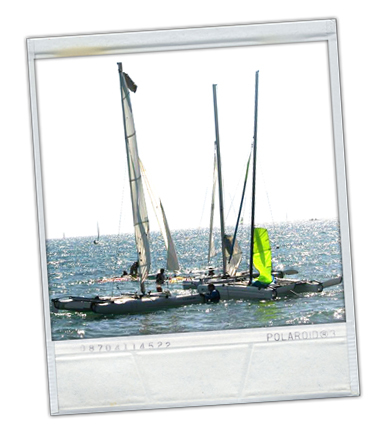 Who is out on the water for an introduction to sailing? That’ll be the seven year olds and that group of teenagers taking tennis lessons? That’s the Indy’s (teenagers to you and me). For my family this meant we quickly settled into a routine of breakfast together followed by activities followed by lunch together and then my brood would be off again. I’d often hear a shout or a scream of hello, as they rotated from one activity to the next, only for them to briefly reappear for an ice cream with us by the poolside bar before shooting off again. 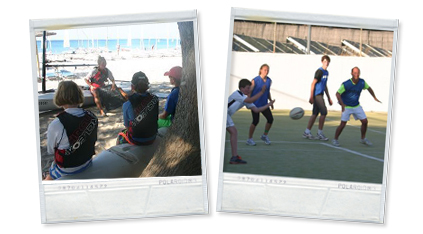 The instruction for these activities can be pretty in-depth, if you want to really go for it. My daughter sat two stages of an RYA sailing course over the fortnight whilst a friend of hers earned her PADI “open water” in the same period. If you still have energy left over, and many do, there are games of football and touch-rugby most evenings with kid’s shows and staff entertainment after supper. With so much of the holiday spent “in resort” the catering set-up could be a deal-breaker but there were plenty of options for all appetites dotted around the resort. All the meals in the main eating area were served “buffet style” starting with breakfast, which ranged from tons of fresh fruit and beautifully cooked omelettes for the health freaks, right up to a full English for those of a more robust persuasion. Lunch offered a number of choices from a toasted sandwich at the beach bar to a “sit-down” hot lunch with pizza, grilled meats and salads in a stand-alone shaded eating area if you fancied making it more of an event. Evening meals could also be taken buffet style in the main eating area but there were other options too such as a standalone Greek restaurant and an adjacent pizzeria if lingering over your wine and kleftiko was a little more your style. After all that activity and food we’d usually waddle off to play Uno as a family before packing the children off to bed and then “staying up” with other parents to swap sailing, tennis and cycling war stories. My husband adores the sailing and the tennis. For him the easy access to tennis tournament and dinghy races really makes his holiday. For my children, it’s the combination of new friends, activities and the freedom to run around a safe environment and for me, it’s sitting by the pool, reading and then listening to all their stories before they shoot off to do it all again. And as I watch them run off to swim, sail or play my abiding memory of Lakitira is just like those old Berocca adverts: it’s my family, but on a really really good day. Includes; British Airways flights from Heathrow T5, resort transfers, half board accommodation, childcare from 4 – 17 years (4 months – 2 years is chargeable), evening creche, sailing and windsurfing with tuition, kayaking, SUP boarding, tennis, mountain biking and a fitness programme. Disclosure: we paid for our holiday. MW are an advertiser of NVN but this review was independently written.